Throughout Alsace there is a significant diversity in terms of soils, with clay, limestone, marl, granite, gneiss, schist, and even volcanic soils all coexisting in the region. This results in marked differences in the grapes that are grown in the area, depending also on the type of soil the grapevines benefit from. Generally speaking, the Alsace vineyards are located at an altitude between 650 ft/200 mt and 1,300 ft/400 mt above sea level on the foothills of the Vosges Mountains, for maximum sun exposure. Crémant d’Alsace AOC: created in 1976, it represents 24.5% of total production and is reserved to sparkling wines made according to the Classic Method. Having said that, for the purposes of this post, we will focus only on the Alsace AOC appellation. The vast majority of the Alsace AOC wines are still white wines (92% of the total) and all Alsace AOC wines must be bottled using the typical “Rhine bottle” (AKA “flûte”). There are eight main grape varieties that are authorized under the Alsace AOC rules: Riesling, Pinot Blanc, Auxerrois (which in Alsace is confusingly considered interchangeable with Pinot Blanc, although it is a separate variety – see below), Gewürztraminer, Pinot Gris, Sylvaner, Muscat d’Alsace and Pinot Noir (the only permitted black-berried variety). For completeness, under the rules of both the Alsace AOC and the Alsace Grand Cru AOC appellations, grapes of any of four permitted varieties that are harvested very late in the season and that have developed “noble rot” (Botrytis cinerea) may be labeled as Vendages Tardives or Sélection de Grains Nobles, two particularly sought after sweet raisin wines. Total vineyard extension in Alsace in 2014 was 15,545 HA. The three most planted varieties are Riesling (21.8% of the total), Pinot Blanc/Auxerrois (21.3%) and Gewürztraminer (19.8%), followed by Pinot Gris (15.4%). Note how even for statistical purposes Pinot Blanc and Auxerrois are mistakenly considered together despite their being two different varieties. Total annual production in Alsace of AOC wines is about 150 million bottles, accounting for 18% of the total production in France of still white AOC wines. Of those, about 36 million bottles (or 26% of the total) are exported. For the purposes of our forthcoming reviews of the three Alsatian Pinot Blancs, we will focus here on the following four varieties: Auxerrois, Pinot Blanc, Pinot Gris and Pinot Noir. Auxerrois is a white-berried grape variety from France’s Alsace-Lorraine region. The earliest documented reference to this variety occurred in 1816 in France’s Moselle region. DNA analysis showed that Auxerrois is one of the several natural crosses between Pinot and Gouais Blanc, which therefore makes it a sister variety of Chardonnay and explains why it is known as “Pinot Auxerrois” in Alsace. Auxerrois wines tend to be fairly neutral and low in acidity. In Alsace it is generally blended with Pinot Blanc: it is interesting to note that, somewhat surprisingly, Alsace AOC rules permit that a wine labeled “Pinot Blanc” be actually prevalently made out of Auxerrois grapes or even exclusively (as in, 100% Auxerrois)! In France there were 2,330 HA of total Auxerrois plantings in 2008, mostly in Alsace and the French Moselle, while Germany had 285 HA, mostly in the Baden and Pfalz regions. Pinot Blanc, AKA Pinot Bianco, is not a separate grape variety: DNA analysis proved that it is a clone of the Pinot grape variety (for more information, see the “Pinot” entry in our Grape Variety Archive) and specifically a color mutation of Pinot Noir. Pinot Blanc is a white-berried grape. Until the end of the XIX century, Pinot Blanc used to be often confused with Chardonnay, until French ampelographer Victor Pulliat in 1868 distinguished the two different grapes. Pinot Blanc wines tend to be moderately structured and have moderate acidity. It may be used in the blend of Classic Method sparkling wines (this practice is fairly frequent in Italy, where several producers use Pinot Bianco in lieu of Pinot Meunier in the blend of their Classic Method sparklers). France had 1,292 HA of Pinot Blanc plantings in 2009, most of which in the Alsace region, where Pinot Blanc can be used for making both still wines (oftentimes blended with other varieties) and Crémant d’Alsace sparkling wines. Some Pinot Blanc is also grown in the French Moselle region. Italy had a total of 5,126 HA of Pinot Bianco vineyards in 2000, most of which in the north east (e.g., in the Alto Adige and Friuli regions) and in Lombardia (where it is mostly used as a blending partner of Pinot Nero and Chardonnay in certain Franciacorta Classic Method sparkling wines). Germany’s Pinot Blanc (locally known as Weissburgunder) plantings in 2008 were 3,731 HA, most of which in the Baden region, while Austria had 1,995 HA in 2010. In the USA, most Pinot Blanc vineyards occur in California (particularly in Santa Barbara, Sonomona and Monterey), although total plantings were a mere 217 HA in 2010. Pinot Gris, AKA Pinot Grigio, is not a separate grape variety: DNA analysis proved that it is a clone of the Pinot grape variety (for more information, see the “Pinot” entry) and specifically a color mutation of Pinot Noir whose origins can be traced back to the XVIII century in both Germany, where it was first mentioned in writing in 1711 in the Baden-Württemberg region under the name Rülander, and France, where it was mentioned in a 1712 document in the region of Orléans under the name Auvernat Gris. The first references to the current Pinot Gris name date back to 1783-1784 in Burgundy’s Côte d’Or region. Pinot Grigio is said to have been cultivated in northern Italy (especially in Piemonte) since the early XIX century. Pinot Grigio is a grey-berried grape which may be much darker in color than most white-berried grapes and generally has high sugar levels and moderate acidity. In France total Pinot Gris plantings in 2009 were 2,617 HA, mostly in Alsace. In Italy, for some reason, Pinot Grigio came into fashion in the late Ninenties/early two thousands, which is confirmed by the staggering size of Pinot Grigio plantings in Italy which, at 6,668 HA in 2000, are almost three times as much as France’s. This trend was fueled by booming exports especially to the UK and the US of mostly inexpensive and lackluster wines made out of an overproduction of this grape variety. This phenomenon somewhat tarnished the reputation of Pinot Grigio, which was often associated with a cheap, mass-production type of wine, until in the last few years it started falling out of favor. Fortunately, quality Italian Pinot Grigio is still made, particularly in the regions of Friuli, Alto Adige and Veneto. In 2008, Germany had 4,481 HA of Pinot Gris (locally known as Grauburgunder), mostly concentrated in the Baden, Rheinhessen and Pfalz regions, while Hungary had 1,522 HAof plantings under the local name Szürkebarát, mostly in the north of the country. Following in Italy’s footsteps, even California knew a Pinot Grigio boom, which led to total plantings of 5,223 HA in 2010. Pinot Gris is also considered Oregon‘s signature white wine with 1,107 HA of vineyards in 2008. Pinot Noir is a black-berried clone of the Pinot grape variety (for more information, see the “Pinot” entry in our Grape Variety Archive). Before being given its current name, Pinot Noir was known by three main synonyms: Morillon, Noirien and Auvernat. The earliest documented mention of Pinot Noir dates back to 1283 in the Île-de-France region in northern France under the name “Moreillon“. The name “Noirien” was used around that same time to indicate Pinot Noir in Burgundy and particularly in the Côte d’Or. The name “Auvernas” was instead used somewhat later, in the XIV century in the Loiret district. 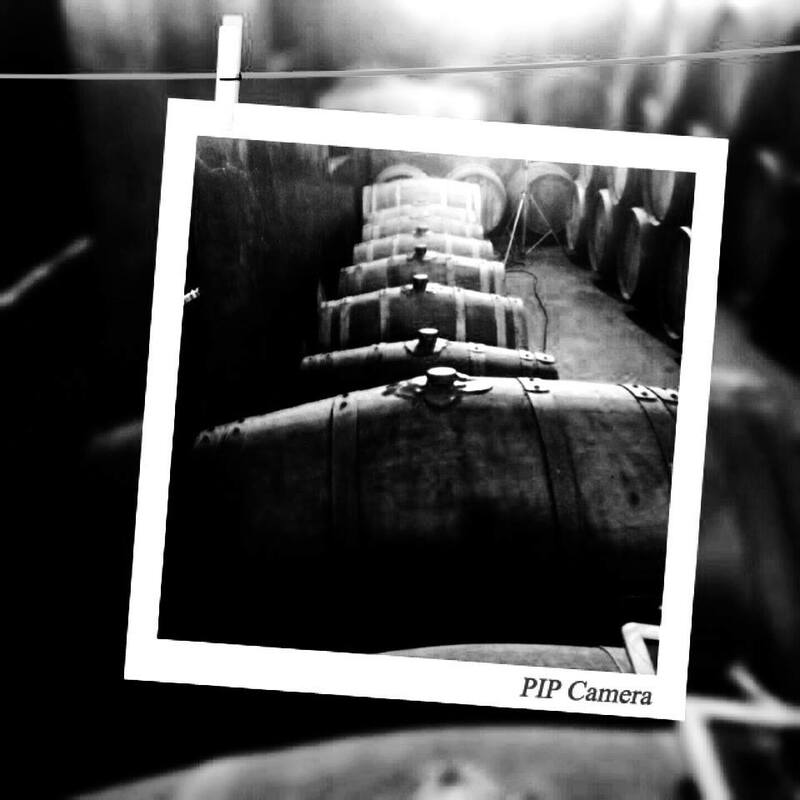 The first documented use of the current name Pinot took place in France in 1375. Pinot Noir vines like temperate climates and do particularly well in calcareous-clay soils. The early ripening characteristics of Pinot Noir make it suitable to cooler climate regions, the only ones to permit a long enough growing season to produce interesting wines. Pinot Noirs tend to have relatively soft tannins and to be fruity and easy to like, with some of the best quality Burgundy examples requiring several years of cellaring to fully assemble and perform at their best. Some of the world’s best examples of quality Pinot Nors can be found in France’s Burgundy region, where terroir differences can often be noticeable in Burgundy wines. Outside Burgundy, quality Pinot Noirs can also be found in France’s Jura region. In 2009 total Pinot Noir plantings in France were 29,576 HA, most of which (10,691 HA) in the Champagne region where it is one of the key components in the traditional Champagne blend, vis-à-vis just 6,579 HA in Burgundy’s Côte d’Or. Northern Italy also makes quality Pinot Noirs, especially in the Alto Adige region and in Lombardia’s Oltrepò Pavese. Total plantings in 2000 were 3,314 HA. In Germany, Pinot Noir (locally known as Spätburgunder) enjoys huge popularity, which reflects in its 11,800 HA of plantings in 2008, most of which in the regions of Baden, Rheinhessen and Württemberg. With 4,401 HA in 2009, Switzerland also has substantial Pinot Noir plantings (under the name Blauburgunder). In the USA, Pinot Nor is big in California, thanks also to the notoriety that the “Sideways effect” brought to the grape, which in 2010 had a total of 15,091 HA of vineyards, especially in Sonoma and Monterey. Oregon also had 4.533 HA of plantings in 2008, mainly in the Willamette Valley. Both Australia and New Zealand have sizable Pinot Noir plantings, with respectively 4,490 HA in 2008 (particularly in the Yarra Valley in the state of Victoria and in Tasmania) and 5,000 HA in 2011 (especially in the Marlborough area). At the time of this post, the project is still a work in progress as a little more than 70% of Italy’s DOCG appellations (i.e., all those in Northern Italy plus Emilia Romagna and Toscana in Central Italy) are available live on the blog, but the project will be progressively completed in the next month or so. UPDATE: Just a quick update to inform readers that, as of April 18, 100% of the DOCG appellations are in final form and therefore the project has been completed and is fully available. Highlighting the peculiarities of Italy’s different wine regions and permitted grape varieties. 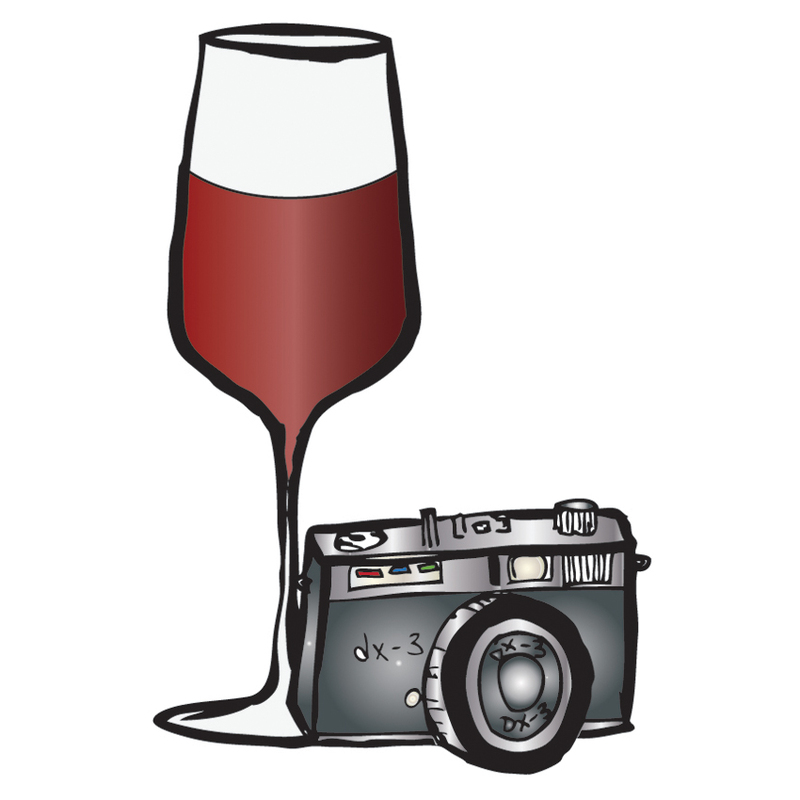 This resource is accessible through the “Wine” drop-down menu of our blog, through the button on the sidebar or through this link. I would appreciate it if you could take the time to take a look for yourself, tour your favorite Italian wine regions and see how you like it. Your feedback, comments or feature requests are always welcome. 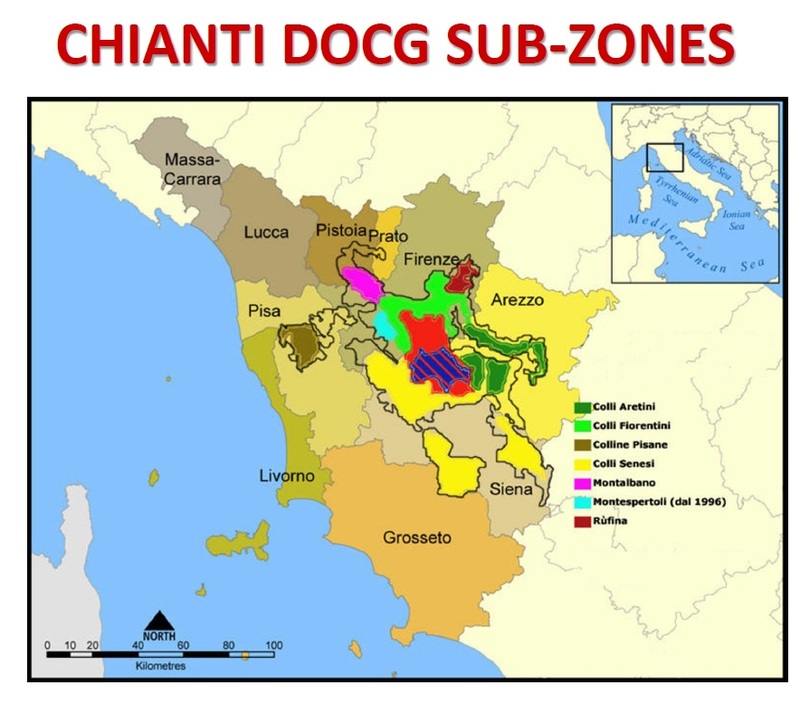 This entry was posted in Wine, Wine Education, Wine Regions and tagged appellation, archive, database, DOCG, education, Italian, Italy, regulations, wine on April 13, 2015 by Stefano. Thirteen different grape varieties were originally authorized in the Châteauneuf-du-Pape vineyards (now they have been increased to 18), with Grenache, Syrah and Mourvèdre (the so-called “GSM“) being the dominating varieties, as well as the traditional core grapes in the Châteauneuf-du-Pape blend (see below for more information about these grape varieties). Other permitted varieties include Cinsaut, Clairette, Roussanne, Muscardin and Picpoul. 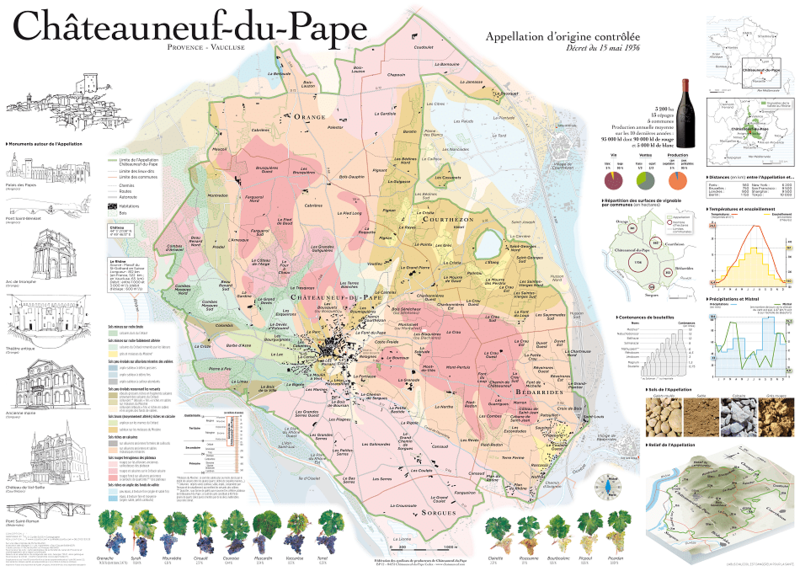 Total production in the Châteauneuf-du-Pape appellation is approximately 14 million bottles per year. Although the Châteauneuf-du-Pape AOC regulations permit the production of both red and white wines, reds largely dominate (on average, 94% red versus 6% white). About 60% of all Châteauneuf-du-Pape wine is exported, with Switzerland, Belgium and Germany being the main importing countries. In 1309, distressed by factionalism in Rome, pope Clement V decided to move the papal capital from Rome to southern France and, as a result, the popes took temporary residence in Avignon, France. The so-called “Avignon papacy” period ended in 1377, when pope Gregory XI moved the papal capital back to Rome. During the Avignon papacy, under pope John XXII, the village of Châteauneuf-du-Pape became the summer residence of the popes. Pope John XXII granted the local wine the rank of “Vin du Pape” (meaning, “pope’s wine”), thus opening Châteauneuf-du-Pape wines the doors to the European nobility’s courts. Châteauneuf-du-Pape later became one of the first French AOC wines, in 1936. In 1937, the estate owners in the Châteauneuf-du-Pape appellation territory created the famous bottle that is still used nowadays for their wines, with the embossed logo symbolizing a papal tiara placed above the keys of St. Peter with the inscription: “Châteauneuf-du-Pape contrôlé” written in Gothic letters around this emblem. Soil in the Châteauneuf-du-Pape area can be very diverse: generally speaking, the western part is mostly limestone, while sand and clay soil with large stones occur on the plateaus; mixed sand, limestone and red and grey clay dominate in the northern part, while shallow sand and clay soil on a well-drained layer of gravel is typical of the south. The large pebbles that are typical of the area contribute to the quality of the vines and grapes by storing heat during the day and holding water. Garnacha is an old variety that has undergone several color mutations (there are a black-berried variety, a grey-berried one and a white-berried one) and whose origins are uncertain: it may be Spanish (most probably from the Aragón region) or it may be Italian (from the island of Sardinia, where it is locally known as “Cannonau“). The earliest documented mention of Garnacha in Spain dates back to 1513, when it was referred to as “Aragones“, while its first mention under the name “Garnacha” occurred in 1678. On the other hand, in Italy’s Sardinia island, the earliest mention of Garnacha, under the old local name “Canonat“, was in 1549. If historical data make both hypotheses plausible in terms of where the variety originated, DNA data seem to indicate a Spanish origin. Garnacha is also known in France under the local name “Grenache“. Garnacha Tinta (Garnacha’s black-berried color mutation) is one of the world’s most planted varieties. It is prevalently used in the context of blends, notably in the one typical of Châteauneuf-du-Pape wines, which is generally referred to as “GSM“, standing for Grenache, Syrah and Mourvèdre. In France, where it is known under the name “Grenache Noir“, it is the second most planted variety after Merlot, with a total of 94,240 HA of vineyards in 2009, almost exclusively in southern France and particularly in the southern Rhône district, where it is the prevailing blending partner in Châteauneuf-du-Pape wines. These tend to be deep-colored, high in ABV and often tannic, with herby and spicy notes. Syrah is a black-berried grape variety that is indigenous to the northern Rhône region of France, where it was first mentioned in a document dating back to 1781 under the name “Sira de l’Hermitage“. DNA analysis proved that Syrah is a natural cross between Mondeuse Blanche (a Savoie variety) and Dureza (an Ardeche variety) that probably took place in the Rhône-Alps region. Syrah has historically been mostly grown in the Rhône Valley in France and in Australia under the name Shiraz, although recently its planting has become more widespread as a result of an increasing popularity of its wines. Monastrell is a black-berried grape variety that originates from the Valencia region, in eastern Spain. The name derives from Latin and is a diminutive of the word “monastery”, suggesting that the variety was first cultivated by monks. The earliest documented use of the name Monastrell dates back to 1381 in the Catalunya region of Spain. Monastrell later made it into France (probably in the XVI century) from the Spanish port-town of Sagunto near Valencia, which in Catalan was known as Morvedre, so in France the grape took the name of Mourvèdre. Monastrell wines are typically high in alcohol and tannins and may have intense aromas of blackberry. Monastrell/Mourvèdre is widely grown in Spain and in France, and it is also cultivated in the USA (especially in California), Australia and South Africa, where it is sometimes known under the name of “Mataro“, which was the name of a Spanish town on the Mediterranean. Traditionally, in Châteauneuf-du-Pape wine has been fermented in concrete tanks. Since the 1980’s, however, many winemakers have switched to stainless steel vats, as they are more hygienic, are easier to clean and allow a more precise temperature control. Recently there has been a trend to go back to fermenting the grapes in newer, coated versions of the traditional concrete tanks, which have made them more efficient and acceptable by today’s winemaking quality standards. Since Châteauneuf-du-Pape wines are blends, winemakers can choose between two different fermentation techniques. One is known as co-fermentation and calls for mixing all the varieties in the blend within the same tank and fermenting them all together. The other technique instead calls for separate fermentation of the different grape varieties (so as to keep their main characteristics intact) with the resulting wines being later assembled in the final blend. Alcoholic fermentation of red Châteauneuf-du-Pape wines usually lasts between one and four weeks and is generally followed by malolactic fermentation. The wines are then aged in stainless steel, epoxy or concrete vats and/or in oak barrels for 10 to 18 months. During this period, racking may take place one or more times. This entry was posted in Red Wines, Wine, Wine Education, Wine Regions and tagged AOC, blend, Châteauneuf-du-Pape, education, France, French, grape, Grenache, GSM, Mourvedre, red, Rhône Valley, Syrah, variety, wine, Wine Grapes on March 29, 2015 by Stefano. DNA analysis supports the authors’ theory as Aglianico’s DNA profile does not resemble that of any of the modern Greek grape varieties, while it is similar to Aglianicone’s, a Campanian variety which could be an offspring of Aglianico. Outside Italy, limited plantings of Aglianico may be found in Australia and in California. 1. From Prosecco To Glera: What’s In a Name? Then in 2009, with Prosecco’s popularity and sales soaring (in 2011 the overall production of Prosecco was about 265 million bottles, 55% of which were exported), the consortium of Prosecco producers obtained an official change in the name of the grape variety, from Prosecco to Glera, so that Prosecco would only be the name of the wine (and not of the grape variety too) and could therefore be reserved for its designation of origin, thus preventing other producers from other Italian regions or other countries from calling their sparkling wines Prosecco. The main grape variety that is used in the production of the wine Prosecco was called Prosecco Tondo (now Glera) which DNA profiling has shown to be identical to a rare variety that is indigenous to the Istria region of Croatia named Teran Bijeli. This evidence supports the theory of an Istrian origin for the Prosecco/Glera grape variety. Glera is a partly-aromatic white-berried grape variety. The regulations of the two DOCG appellations require that their Prosecco wines be made for 85% or more from Glera grapes, to which up to 15% of Verdiso, Bianchetta Trevigiana, Perera or Glera Lunga white-berried grapes may be blended. The regulations of the DOC appellation are similar but permit that a few additional grape varieties be blended to the Glera base grapes, as follows: Chardonnay, Pinot Bianco, Pinot Grigio or Pinot Noir. Prosecco is one of the main examples of a sparkling wine made according to the so-called Charmat-Martinotti Method production process, although there are a few producers who also make some very good Classic Method Prosecco’s (including Valdo‘s excellent Numero 10 – check out our post with a full review). Compared to the Classic Method, the Charmat-Martinotti Method is a quicker and cheaper production process for sparkling wine, which is known to maximize primary (or varietal) aromas although it generally sacrifices the wine structure and the finest perlage. For more detailed information, please refer to our post on the Charmat-Martinotti Method. This entry was posted in Variety Show, Wine, Wine Education and tagged Charmat-Martinotti Method, Classic Method, education, Friuli, Glera, grape, Italian, Italy, Numero 10, Prosecco, sparkling, spumante, Valdo, variety, Variety Show, Veneto, white, wine, Wine Grapes on March 1, 2015 by Stefano. Each post in this series will also include a few recommended producers and wines made from each of the featured grape varieties. The FsT Wine Tasting Chart is a free download for all, but please (i) refrain from using it for commercial purposes without asking for our prior consent and (ii) if you want to share it via social media or your own website or blog, feel free to do so but give proper credit to the author (Stefano Crosio, Flora’s Table, LLC) and the source by linking to this post. This entry was posted in Red Wines, Wine, Wine Education, Wine Regions, Wine Reviews, Winevents and tagged 2014, appellation, Chianti, Classico, DOCG, education, event, Italian, Italy, New York, red, review, tasting, Tuscany, USA, wine on May 25, 2014 by Stefano. This entry was posted in Meet the Maker, Wine, Wine Education and tagged Ar.Pe.Pe., ArPePe, Chiavennasca, DOCG, education, enologist, interview, Isabella Pellizzatti Perego, Italian, Italy, Nebbiolo, red, Superiore, technique, Valtellina, wine on December 18, 2013 by Stefano.